Elvis Presley’s phenomenal rise to fame in the mid-fifties can be defined by astonishing numbers—large concert crowds, vinyl sales in the millions, chart-topping songs, record TV ratings, huge movie box office receipts, countless spinoff products, extensive press coverage, and so on. Those numbers, however, portray Presleymania as a general, pervasive movement among American teenagers at the time. 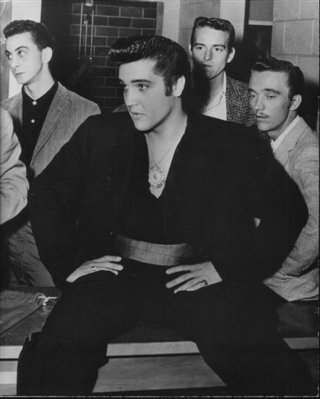 In reality, though, Presley’s fame was earned at ground level, in thousands of battles fought in the local radio stations, newspapers, record stores, and schools. To illustrate let’s look back on how one community’s teenagers viewed Elvis Presley in 1957. I grew up in Spokane, a medium-sized American city on the eastern edge of Washington State. My teenage years were still ahead of me in 1957, so I can’t testify personally to how the city’s young people reacted to Elvis during that year. For that we have to depend on the records of the local rock ’n’ roll radio stations and the newspaper files of the city’s two biggest high schools. The only Spokane radio station that had fully embraced rock ’n’ roll by 1957 was KNEW. Their disc jockeys, who became local celebrities, compiled a local weekly top 40 list. Their compilation, which often differed widely from Billboard’s national chart, relied heavily on call-in song requests and responses by teenagers who attended dance parties sponsored by the station. Many of those teenagers attended Lewis and Clark High School on the near south side of town or North Central High School across the river on the near north side. Both schools drew over 2,000 students from diverse neighborhoods, ranging from poor to affluent. Their school newspaper archives for 1957 reveal the extent to which rock ’n’ roll in general and Elvis Presley in particular played a role in the lives of Spokane teens. As the calendar turned to 1957, the city’s high schoolers returned to the classroom following Christmas break. That semester a column titled “Platter Chatter by Betty” debuted in the North Central H.S. newspaper. The column, which ran weekly when school was in session through 1957, included a list of Spokane’s top ten tunes, as compiled by KNEW. It also featured commentary on current popular records and Betty’s predictions of future hits. In early February, while Elvis was in Hollywood filming Loving You, Betty first ran Spokane’s “top ten tunes” for the week in her column. Topping the list was Tab Hunter’s “Young Love,” followed by “Singing the Blues” by Guy Mitchell, and “Don’t Forbid Me” by Pat Boone. 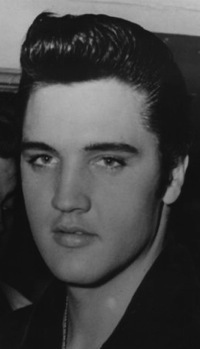 Elvis had two songs further down, “Love Me Tender” at #5 and his new single, “Too Much,” at #10. That same week on Billboard’s national chart, “Love Me Tender” was at #13, while “Too Much” sat at #7. In their acceptance of these two Presley tunes, Spokane teens generally were following the national trend at the time. 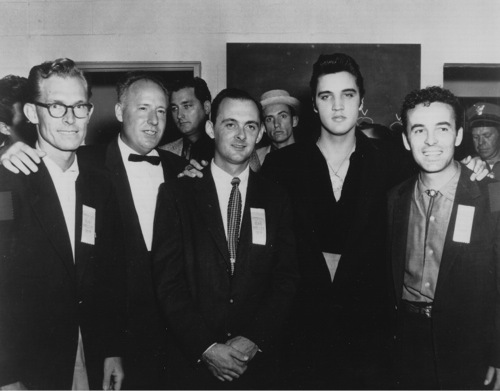 Elvis with KNEW DJs (from left) Bob Hough, Bob Salter, Bob Adkins, and Bob Fleming. In the rest of her column during February and March, Betty made no mention of Elvis. During the first three months of 1957, she instead sang the praises of other artists, including soon-to-be-displaced crooners Guy Mitchell, Vaughn Monroe, and Perry Como. She also gave props to Presley’s young competitors, including Tab Hunter, Pat Boone, and Harry Belafonte, then riding the crest of the short-lived calypso craze in early 1957. Spokane’s teens hung onto “Love Me Tender” longer than elsewhere in the country. On March 1 it was still on KNEW’s top ten, although it had dropped off Billboard’s chart over a month earlier. Conversely, “Too Much” was off Spokane’s top ten several weeks before the national chart. It appeared that Spokane teens preferred Presley’s ballads to his rock ’n’ roll material. Two weeks later “All Shook Up” shot all the way up to #2 on the local chart. 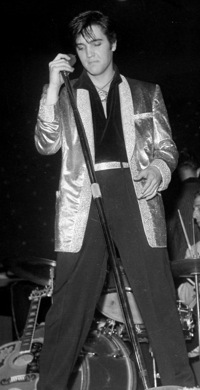 “Since the last issue of The News, there have really been some changes in the record field,” Betty admitted, “with Mr. Presley making a return appearance to the top ten after a brief absence.” That same week, Elvis’s new single reached the top of the national chart, where it reigned for eight weeks. Through the end of school year in June, “All Shook Up” dueled with “Little Darlin’” by The Diamonds for the #1 spot in Spokane. It turned out that two major Elvis events in Spokane during the summer of 1957 solidified his popularly in the city. The first was the arrival of Presley’s second movie, Loving You. From her office in the downtown Spokesman-Review building, columnist Dorothy Powers could see the teenagers lined up around the block at the Fox Theater for the movie’s first showing on July 31. Grabbing her notepad, Powers crossed the street to interview some of the kids waiting to get tickets. 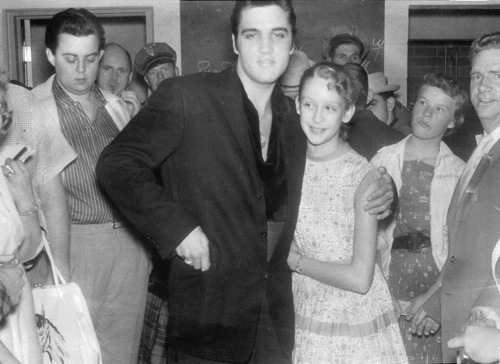 Elvis with a young admirer at Spokane press conference. Colonel Parker is in background to the left. Four weeks later, the greatest of all Elvis shows came to town. Elvis himself stepped onto the platform at the Great Northern railroad depot in Spokane near midnight on Thursday, August 29, 1957. Although the location and time of his arrival had been printed in that morning’s newspaper, only about twenty fans were there to greet him. It was late on a weeknight, after all, and fathers who had to work the next day no doubt refused to chauffer their daughters downtown on a fool’s errand. Indeed, four tracks from Loving You were among the city’s most popular tunes. “Mean Woman Blues” was #1. It, along with “Party” (#4) and “Lonesome Cowboy” (#9), were soundtrack songs that never appeared on Billboard’s national chart but were being played heavily by DJs in Spokane. For seven straight weeks, starting on October 18 and leading up to Christmas break on December 20, Elvis placed three songs every week in Spokane’s top ten records list. Of particular note was “Baby, I Don’t Care,” another Elvis soundtrack song that never even made it into Billboard’s Top 100 chart. It was the most popular song in Spokane for two weeks in December 1957. "Well, it looks as though ‘Mr. Presley’ has taken all the top honors this week with four of his original songs on the ‘Top Ten.’ Did I hear someone say ‘Presley is dying out?’ I think someone goofed!"